Anemometer with a very good price/performance ratio determines wind speed. This anemometer is a high precision meter and a part of air-technician's equipment for the adjustment and control of ventilation systems. They are also used in institutional research and development. Due to its short measurement range and high accuracy, this anemometer can be used for the analysis of buildings. 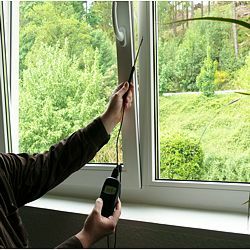 With its high resolution, you can detect tiny wind speeds and also determine air temperature. 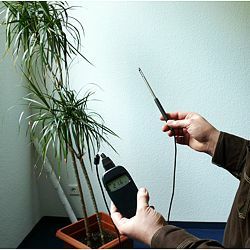 Thin tip (6 mm diameter) allows the anemometer to be used in confined spaces (e.g. ventilation grilles). You will find an overview of all types of anemometers if you follow this link. Anemometer 5 ° C - 40 ° C/<80% H.r. Temperature sensor: 0 ° C - 50 ° C/<80% H.r. 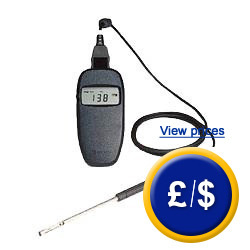 1 x A004 KM anemometer with separate temperature sensor cable (1.5 m), 4 x batteries and user manual.